For over 100 years, surgeons have been attempting to find newer and safer ways to operate on pathology of the cerebellopontine angle. Because of the anatomical relationships related to the cerebellopontine angle, there is perhaps no other region of the brain that a keyhole endoscopic, endoscope-assisted, or microscopic approach is better suited. With improvements in neurosurgical instrumentation, illumination, and magnification, the retrosigmoid keyhole approach has become the workhorse approach to the cerebellopontine angle. 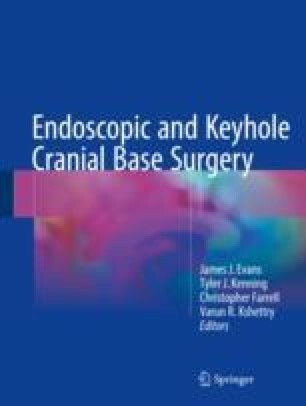 In this chapter, the authors will review the keyhole retrosigmoid approach to the cerebellopontine angle. Pertinent anatomy of the region will be presented. Indications, risks, benefits, and technical details of the keyhole retrosigmoid approach will be reviewed. Differences between endoscopic and microscopic assistance with this approach will be discussed.